Recently Management sent a “Bargaining Update” to all WSNA RNs. Reading this update, some nurses may have concluded that it was a joint communication from Management and WSNA. IT WAS NOT. WSNA had no role in preparing the “update” which was, instead, prepared solely by Management. WSNA does not produce joint communications with Management, as we prefer to provide accurate material for our members to read and consider. Management’s “update” does not present a complete picture of what is happening at the negotiating table, as you will see below. In a nutshell, Management has proposed drastic changes to your current paid-leave benefits that, if Management has its way, would begin to take effect in 2020. Your WSNA bargaining team does not feel these changes are in our best interest, and we are fighting hard at the table to ensure that you have fully-paid time away from work for vacations and to care for ourself and our family members when they are ill. By being informed and knowing what is at stake, you can help our bargaining team accomplish its goal. Requiring nurses, once EIT goes away, to use PTO (vacation time) for 7 days, before being able to utilize Short Term Disability (STD) benefits that pay only 65%. Currently, nurses have to use only 8 to 16 hours of PTO (depending upon FTE) before accessing EIT, which is paid at 100%. Eliminating the accrual of EIT which currently can be used to care for sick family members and replace it with a STD plan which cannot be used to care for sick family members. You would have to use PTO (vacation) to care for sick family members. Requiring nurses to have STD claims approved by a third-party administrator, unlike the current EIT program. We have heard from nurses working under a Providence STD plan that the approval process is cumbersome and intrusive, with many hoops to jump through. Not every claim is approved. Reducing PTO accruals for many nurses. WSNA – The proposed plan by Management does operate like medical insurance. In your opinion, how easily is a claim processed through medical insurance? Is it always covered? Guaranteed? We all know from our own experiences, medical insurance can be a cumbersome, frustrating process that leaves us in the dark when the final bill arrives. Your current contract, that includes your Extended Illness Time, protects your time off, and puts YOU in the driver’s seat. Not anyone else. Under the new STD plan, a third party would decide whether your claim is approved. WSNA – Not only will this “new” plan not cover your full wages, you will be required to apply for the coverage and await approval. Nothing is automatic. Right now, your current WSNA contract provides you predictability - not unknowns. Furthermore, you must wait a full 7 days before any coverage will kick in if approved. During the 7 days, you must use PTO or EIT, which will stop accruing after 2019 and will NOT be available to any nurse hired after 2019. The new STD plan will require you to use your valuable vacation time, once EIT goes away, to supplement the 35% that is not covered (If you qualify and are approved to use the STD) if you want to replace 100% of your wages while you are on STD. Your vacation bank will dwindle and leave you less time to take off to recuperate and spend time with your loved ones. Your current contract provides EIT which is paid at 100%. Moreover, Management has reported that managers will earn PTO at a higher level than what is being offered to WSNA. While Management has proposed to increase the cap to the maximum accumulation, the accrual rates are less for more tenured nurses, and it will be difficult for you to reach the max time if you are forced to use it for a sickness lasting less than 7 days. This is a far cry from what you currently have. WSNA has proposed to increase PTO accruals. WSNA – Under Management’s proposal, nurses who are hired after 2019, are not eligible to participate in the EIT program at all. Current employees will not be allowed to accrue any more EIT after 2019 In its proposal, Management has not committed to allowing nurses to use their frozen EIT balances for time off after 2020. For those nurses who have more than 300 hours of EIT, you will be able to cash out any hours above this only upon termination after 20 years of service or more and will receive payout only at 20%. There is a 7-day waiting period, except for birth or placement of a child. You must file a claim with Washington’s Employment Security Department (ESD), notify the employer of the request, and meet certain eligibility requirements. You receive benefits only if ESD approves your claim. You will pay a premium for WPFML benefits which will be taken from your paycheck. You will pay about 63% of the total premium while Providence will pay 37% of the premium. The amount that you receive for WPFML a is a percentage of your weekly wage. The maximum benefit that you can receive is $1,000 per week. It has been estimated that a nurse making $80,000 per year would hit the $1,000 limit. Furthermore, while the rulemaking process for WPFML has not yet been completed, it appears that you will not be able to use PTO/EIT for the same period that you use WPFML. Therefore, you cannot “top up” your WPFML benefit with PTO/EIT to ensure that you receive 100% of your income while you are away from work. RCW 50A.04.045 (2) states: "An employer may allow an employee who has accrued vacation, sick, or other paid time off to choose whether: (a) To take such leave; or (b) not to take such leave and receive paid family or medical leave benefits, as provided in RCW 50A.04.020.” In other words, you cannot receive both at the same time. More information about this can be found at paidleave.wa.gov. WSNA – This is far from the truth. 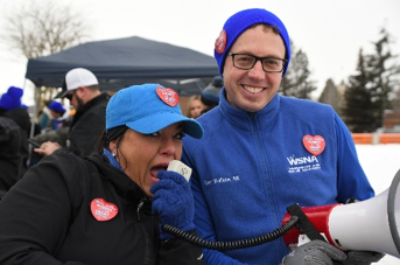 While WSNA negotiates always in good faith, we have made it clear to Management that sick time is valued amongst WSNA and the nurses, and that its proposed STD plan is not good for nurses or for patients. Scenarios based on current contract and Management’s proposed changes to PTO/EIT. These scenarios would apply to all nurses hired after 2019 and to all currently employed nurses whose EIT banks will be frozen after 2019 and who have exhausted their existing EIT balances. #1 RN who works 24 hours per week (three 8-hour shifts) in a benefited position and has worked at SHMC for 4 years has a bad cold/fever and calls in sick all three of her shifts that week. RN currently would have to use 8 hours of PTO at full rate of pay. Then RN would use 16 hours of EIT at full rate of pay. At step 5 of the pay scale rate of pay would be $36.23/hour. RN would receive full pay of $869.52. This nurse accrues 144 hours (18 days) of PTO per year. RN currently would have to use 24 hours of PTO at full rate of pay. RN would receive full pay of $869.52 but all of it would be the RN’s accrued PTO. In the above scenario, this nurse will be using 16 hours more of their PTO while earning 9.6 hours less PTO per year. #2 RN who works 32 hours per week (four 8-hour shifts) in a benefited position and has worked at SHMC for 11 years has a bad cold/fever and calls in sick for two calendar weeks. RN currently would have to use 12 hours of PTO at full rate of pay. Then RN would use 52 hours of EIT at full rate of pay. At step 12 of the pay scale rate of pay would be $44.42/hour. RN would receive full pay of $2842.88. This nurse accrues 230.4 hours (28 days) of PTO per year. RN currently would have to use 32 hours of PTO at full rate of pay. RN would use 32 hours of their PTO for first week of illness 32x $44.42 = $1421.44. RN would receive 32 hours of short-term disability at 65% pay or $923.94 if they qualify for a total pay of $2345.38. This nurse accrues 211.2 hours (26.4 days) of PTO per year which is 19.2 hours less than currently. Using the above scenario, the RN will receive $497.50 less in their paycheck after 2021 and will be using 20 more hours of PTO while accruing 19 hours less PTO per year. 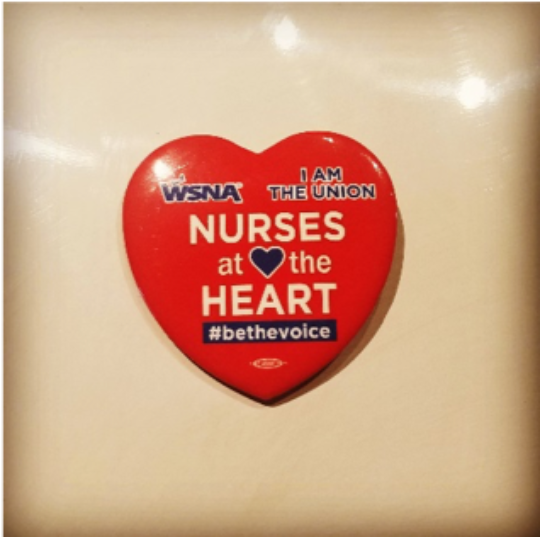 Your fellow nurses on the WSNA bargaining team continue the fight at the table, and it’s up to all of us to stand together with one voice to secure an fair contract! If this is the first time you are hearing this information, it is because you have missed a WSNA local unit meeting. Come to the next local unit meeting. There is room on the CAT for more boots on the ground. Sacred Heart Nurses, you are strong and Management knows it! 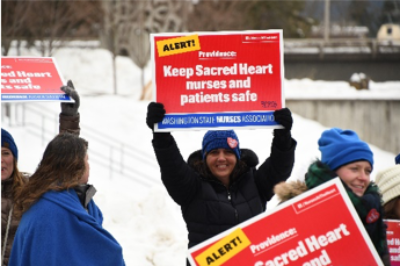 Tell Sacred Heart we will stand together and defend our contract from Management’s attack! Come to the next local unit meeting. Your negotiating team and WSNA nurse reps will be available for one on one discussions of any questions you may have. 8-9 a.m., 1:30-2:30 p.m., 4-5 p.m., 8-9 p.m. Questions? Or want an honest answer? Contact WSNA Nurse Representative Jaclyn Perkins, BSN, RN at jperkins@wsna.org or (800) 231-8482, ext. 3118. Day eight of negotiations is complete. OUR energy and participation from the rally created a different day at the negotiating table. OUR efforts made a difference! We hit this event out of the park! Short Term Disability proposal remains – this proposal is NOT in the best interest of you or your loved ones. There is an extended wait period for 7 days prior to being able to use the short term disability. This is only if you qualify and are approved for a claim. This will require you to use PTO during the waiting time period. In addition, you can’t use the short term disability for family members, only for yourself; and the plan only pays at 65%. Currently, you can use EIT for family members and receive your full wages and have a much shorter waiting period. Management is proposing to reduce PTO accrual for many nurses. Despite having had eight bargaining sessions, management has not moved from the initial across-the-board wage proposal and is proposing an insulting 0.5% guaranteed wage for each year of the contract. Please park at least a block away from the Teamsters building. The turnout has been so high, surrounding businesses are having a hard time with customer parking. Questions? Contact a negotiation team member, a local unit officer or WSNA Nurse Rep Jaclyn Perkins at jperkins@wsna.org. We have had another disappointing negotiation day with very minimal movement at the table. We did successfully fight off management’s proposal to subject more nurses to mandatory shift rotation. We are working hard to improve staffing and language on workplace violence to keep nurses and patients safe. Our next negotiation dates are Feb. 21 and Feb. 27. Share the file below of the sign with family and friends so they can print and post it from home! Questions? Contact WSNA Nurse Rep Jaclyn Perkins at jperkins@wsna.org. It’s time to put nurse and patient safety first. We know it can be difficult to attend these meetings before or after a long day at work, but it is important to attend so we know how much support we have, we can hear your concerns and we can answer your questions. PLEASE make it a priority to come to the next local unit meeting and show our negotiating team that you are supporting their efforts for a fair RN contract. Updates on what is happening at the table will be discussed, as well as future actions. *Please park on the side of the building away from the front door. The attendance of nurses has been so high to these meetings, it has become cumbersome for surrounding businesses. Thank you! Now is the time to get organized so that all 1800 RNs in the bargaining unit are informed and involved. Organization, communication and unity will help us stay strong and fight management's negative proposals. We need reps from every unit posting information on your unit WSNA boards, sending updates via text or email and spreading the word about what we are fighting for in our contract. We would like to update our floor rep list and have a meeting to start organizing and streamlining our message. Please contact WSNA Nurse Rep Jaclyn at Jperkins@wsna.org if you are a floor rep, what unit you are from and your contact information or if you would like to be a floor rep. Your bargaining unit has formed a CAT team consisting of a group of nurses aside from the negotiating team, solely for the purposes of ACTION. These nurses are working hard to support the negotiating team and are planning public campaigns and dispatch! If you want to join them on the CAT team, please email WSNA Nurse Rep Debi at dbessmer@wsna.org. Volunteers are creating t-shirts to wear to future actions and on our days off. We are also creating yard signs and car signs and will notify everyone when they are ready. WEAR your buttons every day! COMMENT and LIKE posts on Facebook Sacred Heart RNs - Nurses at the Heart and The Nurse Brigade. WEAR blue on Tuesdays to support our team and show unity to administration. TALK, TALK, TALK - Spread the word about negotiations to fellow RNs. Get involved! CHECK YOUR PERSONAL EMAIL for updates. If you are not getting email updates from WSNA, send your email address to Jperkins@wsna.org. VISIT this page often for local unit updates. We received the remainder of the employer's proposals and there is a lot to be concerned about. They are proposing to tie wages to performance and undo your union security clause which you fought hard for and it will weaken your collective voice. They are seeking drastic changes to your leave provisions including eliminating EIT (Extended Illness Time) and replacing it with a Short Term Disability plan. Come to the next Local Unit meeting to hear more and find out what you can do! Questions? Contact WSNA Nurse Representative Jaclyn Perkins, BSN, RN at jperkins@wsna.org. Day #3 of negotiations is complete. WSNA has introduced proposals for competitive wage and benefit packages to attract and retain nurses, for staffing that will ensure the safety of nurses and their patients and that will allow nurses to take meal and rest periods and much-needed vacations. We have also made proposals to increase various premiums and to enhance health insurance benefits and to protect nurses from increased health insurance costs in addition to proposals we made regarding floating. We also have submitted a comprehensive proposal to address workplace violence. We are disappointed that we have had three days of bargaining and management has not yet given us a wage or benefit proposal and has “reserved” several important areas of contract for future proposals. Management has promised to give us their complete proposal during the next bargaining session. Some of management’s initial proposals are troubling. For example, management is proposing that it be allowed to give new hires less credit for experience than they currently receive, which would negatively impact recruiting for nurses with experience, and to reduce the supplemental premium while imposing new, onerous scheduling requirements for supplemental nurses, which will make Sacred Heart a much less attractive place for supplemental nurses. They are also proposing to subject more nurses to mandatory shift rotation. As you can see, we have our work cut out for us – but we are energized and up for the challenge! 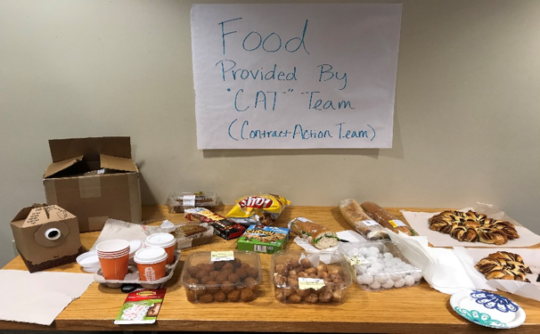 A special thanks to all of our colleagues who prepared snacks and treats for us during our long days of negotiations. It is much appreciated! Our next day to bargain is Dec. 18. Questions? We got answers. We, your negotiating team, will provide more detailed information on what is happening at the table during the next series of local unit meetings. You can contact a negotiation team member or WSNA Nurse Representative Jaclyn Perkins, BSN, RN at jperkins@wsna.org for more information. Day two of negotiations is complete. Management brought forth some of their proposals but nothing yet on wages or benefits. We did present a proposal on workplace violence. There are some very significant proposals on the table. We have seen managements intranet negotiation update site, please realize this is just management's perspective. We are not endorsing this site. 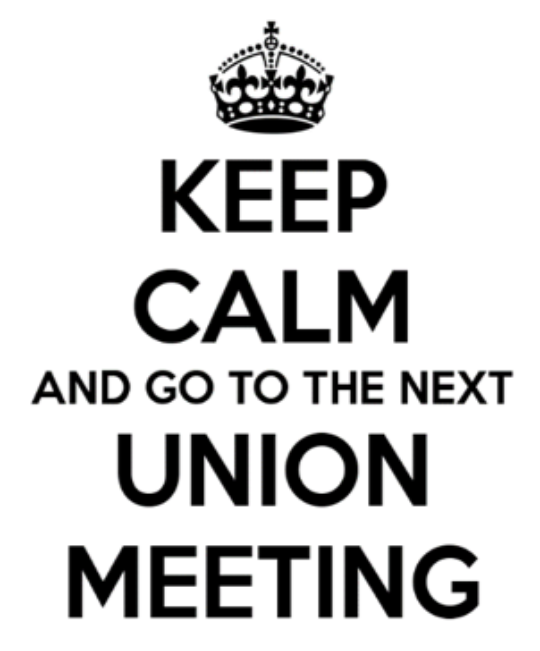 To get negotiation information, please watch for our updates and come to the local unit meeting. Next day to bargain is Nov. 28. Management has canceled negotiations for Dec. 4 due to a family related issue. Reminder: Tuesdays are “Blues days.” Wear blue while at work every Tuesday to show your solidarity and continue wearing those buttons! Local Unit Meetings will be held Dec. 5 at the Teamsters Hall. 1912 N Division St. Suite 200. Verbal updates and discussion will be held during these meetings. Stevie Lynne Krone - 9N, KT Raley Jones - CICU, Clint Wallace - ICU, LaDonna Reel - Mother Baby, Darryl Johnson - CICU, Nonie Kingma - AGPU, Vicki Benson - Radiology, Linda Clanton - IV Therapy, David Emerson - 7N, Lee Ayers - PACU, Inga Matheson - CICU, Abigail Berry - OR or WSNA Nurse Representative Jaclyn Perkins, BSN, RN at 1-800-231-8482, ext. 3112 or jperkins@wsna.org. WSNA, along with our team of nurses, presented our comprehensive proposal to management. We plan to hear a response to our proposals during the next session as well as what they plan to propose. Our next day to bargain is Nov. 16. Come to the Local Unit Rep meeting on Nov. 15 from 5 -7 p.m at Frankie Doodles. “Nurses at the Heart” buttons will be available for buttoning up. Don’t forget! Please wear WSNA blue as a show of solidarity on our negotiation days: Nov. 16, Nov. 28, Dec. 4 and Dec. 18. Or our WSNA nurse representative, Jaclyn Perkins BSN, RN, at 1-800-231-8482, ext. 3118 or at jperkins@wsna.org. Come to the next local unit rep meeting and pick up your WSNA buttons to hand out on your unit. Please wear WSNA BLUE as a show of solidarity on our negotiation days: Nov. 5, Nov. 16, Nov. 28, Dec. 4 and Dec. 16. WSNA Nurse Rep Jaclyn Perkins, BSN, RN will be WSNA/Sacred Heart Medical Center's representative beginning Nov. 1. Jaclyn comes with experience and years of practice. I know you will all welcome her and together, you will continue to make positive changes for Sacred Heart nurses! Jaclyn can be reached at jperkins@wsna.org or at 1-800-231-8482, ext. 3118. You can also contact your officers by calling the voice-tel number at 1-866-305-5612. Our negotiation team is in place and ready to meet with the employer. The team has spent many hours preparing. Our priorities have been set by your responses to the negotiations survey and ongoing feedback regarding issues and concerns about our current contract. We will work for wages, benefits and conditions that allow RNs to deliver safe and effective patient care. Introducing your new WSNA grievance officer! My name is Darryl Johnson. I have a BA in political science and economics from the University of Washington and I have a BSN from Washington State University. I have worked for PSHMC as an RN for a little over 10 years; one year on 8 South, nine years CICU and one year in Cath Lab. The further I have gone through my career, I have come aware of how important a union is needed to protect fellow employees from overreaching management. I have stepped forward to be grievance officer so fellow union members won't have to go through what I went through. I will help you in every which way I can. Come join us for a local unit rep meeting. We need to hear from you as we prepare for negotiations. RSVP to WSNA Nurse Rep Debi Bessmer, RN at 1-800-231-8482, ext. 3112 or at dbessmer@wsna.org. We encourage anyone interested in becoming a Local Unit Rep for their floor to join us. See you there! Come join us for a local unit rep meeting as we start preparing for our negotiations. We encourage anyone interested in becoming a Local Unit Rep for their floor to join us.